In case you hadn't noticed, the holiday season is upon us! Again! It's this time of the year when you exchange gifts with the people near and dear to you have too much food, are warm and happy, while outside, the cold of winter tries to creep in. But not everyone is quite this lucky; some people in this day and age know what it means to be hungry. 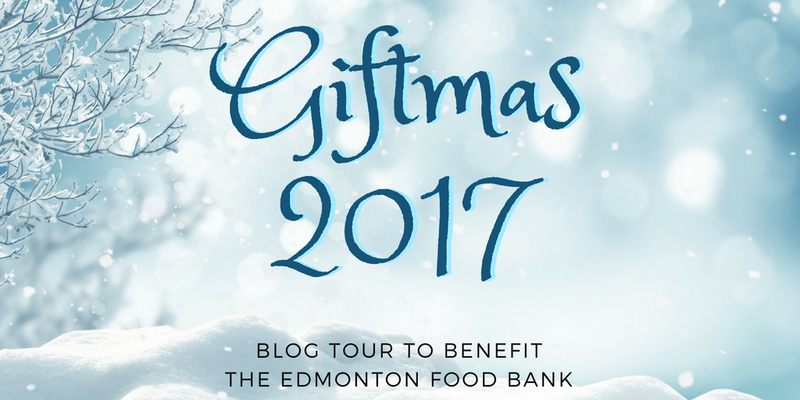 This is why Rhonda Parrish gathered a group of writers and friends around her to raise money for the Edmonton Food bank. Let me be clear, one dollar buys three meals for hungry people. The people that give can also hope to win fantastic prizes, signed copies, Tuckerizations, and more, go here to find out more. There is no excuse not to give, because every dollar counts! 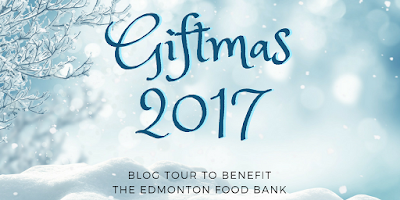 For the Giftmas Blog Tour, I'm giving a warm welcome to Doug Blakeslee (@simms_doug). Enjoy his post. 2017 has been a rough year for a lot of folks, especially in the realm of personal health. I have two friends that have had major issues that have severely affected their lives. In one case, the person was close to having a cardiac incident and thanks to some very observant nurses, the person survived. With their current regimen of medication, they’re thriving and look better than they have in months. Not to say there aren’t rough patches, but there’s hope and that’s nice to know. It’s good to hang out with him and being able to engage in activities. Another had cancer surgery and spent the better part of two months down for the count between recovery and radiation treatment. In both cases, they had a big support network so even at their lowest, they both had places to turn. Their life got turned upside down and they’re not out of the woods yet, but again, a great deal of determination and support. They’re been very transparent about their illness, the side effects, and even the low point of the recovery. Some might have given up. Hell, I’d have not blamed them for doing so, even if it meant future health issues. But they plowed through it and is on the mend. I got to spend time with the person at a recent con and found that while they’ve taken a pounding, the spirit is still there. I figure it was the first they’d really been out in public and being social since the surgery. While fatigued, they powered along and made it through four days without much of a break. At one point, we were at dinner and while there’s difficultly talking due to the surgery, we carried on a conversation for over an hour. Afterwards, they mentioned their jaw hurting but worth it for connecting again. It didn’t seem like much, but the boost to their spirit for such a small thing left me with a good feeling. I didn’t think about it at the time, but as I thought on their words, it struck me that its quite often the small things that mean the most. Being there. Saying hi. Asking how their day went. Listening. Being interested and invested in the person. That can do so much more than anything else. Find someone. Talk with them. Reconnect. You never know how much you can influence someone’s life until you reach out. The author lives in the Pacific Northwest and spends his time writing, cooking, gaming, and watching hockey. His interest in books and reading started early thanks to his parent. From time to time he blogs about writing and other related topics at The Simms Project at http://thesimmsproject.blogspot.com/. He's been published in such anthologies as: “Someone Wicked”, “Stomping Grounds”, “Fossil Lake”, “A Chimerical World: Tales of the Unseelie Court” and others. His current project is an urban fantasy novel about a war between the Fae. He can be reached on Facebook [https://www.facebook.com/doug.blakeslee] or simms.doug@gmail.com. As this is a blog tour, I'd like to invite you to go here and read my guest post. I'm wondering whether we need the holidays, or a version of the holidays. Enjoy!